Should Philly consider 'muralizing' some of its bike lanes? Rendering of a sample painted bike lane, although murals certainly wouldn't have to be done in a graffiti style. Philadelphia is world-renowned for its vast array of public art and the success of its Mural Arts Program, which has produced more than 3,500 community and commissioned works since 1984. Each year, Philadelphia communities engage in 50-100 new projects that draw on the participation of 2,000 residents across three disciplines: Art Education for youth, Restorative Justice for inmates and the Porch Light program for those who struggle with mental illness, addiction and trauma. While the city's walls and storefronts continue to fill up with beautiful collaborations, one area that hasn't been tapped, here or elsewhere, is urban bike lanes. A few weeks ago, the Streets Dept blog drew attention to a post from the MTL Blog in Montreal, where some residents are fed up with the perceived shoddiness of municipal work completed on their bike lanes. 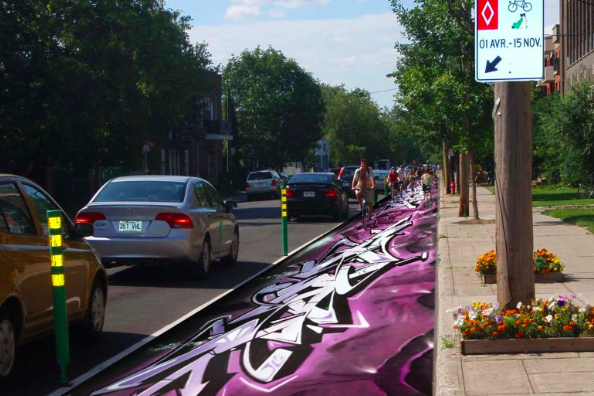 Since city workers there can't seem to draw in a straight line, MTL Blog floated the idea of hiring artists to beautify bike lanes. I think Philly should borrow the idea. And before people start freaking out, I’m not suggesting that we paint every bike lane. Just a handful around the city in key spots, like on The Parkway, along 13th street in the Gayborhood’s restaurant district, on Spring Garden in Northern Liberties … I mean, really any stretch of bike lane where the community wanted it! Something along these lines isn't completely unprecedented, though Streets Dept points out that the idea might be more amenable to areas lined with more businesses than residences. Last July, in a display meant to honor the 50th anniversary of the nation's earliest LGBT demonstrations, Philly Pride teamed up with the city to paint rainbow crosswalks at the intersections of 12th and Locust streets and 13th and Locust streets. While this is a bit different, it wouldn't be too far-fetched if limited to a few areas throughout the city. As it is, Philadelphia is slated to introduce a slew of new protected bike lanes across the city with funds from the federal Transportation Alternative Program. We rank 7th in the U.S. for biking and walking to work. And with Indego's recent expansion, why not boost local tourism by touting some of the city's bike lanes as an artistic experience? Streets Dept listed several likely benefits and couldn't honestly think of real drawbacks to the idea. One could argue that it might pose a distraction, but in a big city, that holds true for just about anything going on at street level. Bikers and drivers always need to exercise caution. It could also be argued that the wear and tear of constant cycling and weather would ruin the artwork, but that's taking a naysaying approach to the idea from the jump. Things like that can be fixed. Throw in Philadelphia Magazine's recent feature, "Jim Kenney's War on Cool," and this actually sounds like an opportunity to at least assess the idea from the standpoint of cost and public value. Plenty of local artists would raise their hands to help make it happen.